8:00 PM departure for an overnight train to Lao Cai. Pick up at Lao Cai station. Drive to Sapa for breakfast. 9:00 Tour Sapa by trekking to Cat Cat village offer many chance to take photos. Visit beautiful waterfall. 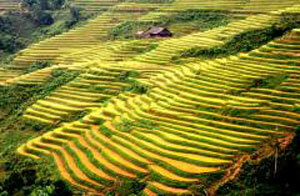 Sapa tours are created for those who love beautiful nature. Afternoon, free to discover beautiful Ham Rong flower garden. Overnight in Sapa. The first day of Sapa tour end. 8:30 Your sapa tours start by trekking through the paths cross rice terrace fields to Y Linh Ho vilage. Trekking though hillsides along MuongHoa river. Cross the river by a suspension bridge to reach Lao Chai village where The H' Mong people live. Enjoy picnic lunch prepared by your guide. Afternoon, cotinue your touring Sapa to Ta Van village of the Dzay and red Dzao minority groups(total trek 17km). Take the paths across the paddy fields, see and chat with minority people working on the fields. The incredibly stunning scenery of Muong Hoa valley with very large rice paddy terrace fields on the slopes of high mountains offers many photoes. Drive back and the end of Sapa tours for the second day. overnight in Sapa. Have breakfast. 8:00 drive to Can Cau market. Discover the social market. Here, minority groups enjoy their happy time after a week hard-working on the fields. Drive back to Bac Ha for lunch. Check in. Afternoon, trek to Ban Pho village to discover the Flower H' Mong daily life. Overnight in Bac Ha. Bac Ha is not only a market for selling, buying but also a meeting area for all local people, especially young couples and at the other corner, you can see some boys flirting girls. This market is one of top destinations for Vietnam holidays. Drive back to Lao Cai. Have dinner. Take the night train back to Hanoi. The fourth day of Sapa tours ends. At 5:00 AM, Car pick up and transfer to your hotel. Now, your tours Sapa package ends. Note: Sapa tours' programme is subject to change without prior notice.